Anybody interested can now calculate and design tailor-made gas springs for their application at www.ace-ace.com/com/calculations.html on the homepage of ACE Stoßdämpfer GmbH. With a customer friendly, easy-to-use software ACE extends its range of calculation programs available online and thus emphasizes the modern, customer-centric approach to its services. Speed and high availability have always been among the strengths of ACE Stoßdämpfer GmbH. Depending on the request, the company based in Langenfeld, Germany, which specializes in automation, motion and vibration control as well as in safety products, supplies customers in the German-speaking region of Europe with a wide range of machine components within 24 hours. These also include industrial gas springs of push and pull types, which are mainly mounted on hoods, flaps, hatches and machine covers and serve to relieve muscle strength by closing and holding and by reliably handling masses without much effort for the users. In the past, inquiries about the availability of a suitable ACE gas spring required direct contact with the ACE gas spring team and the completion of a drafting form sent by fax or e-mail. Thanks to the new online calculation program for gas springs, the design via graphical user interface now takes place faster and at any time. 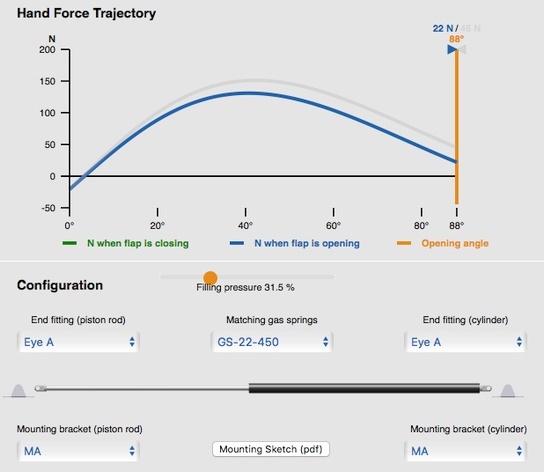 Unique in the industry, because it is completely intuitive, visually structured and optionally supports 2D or 3D visualization, the most common applications of gas springs can now be calculated in a few structured steps. 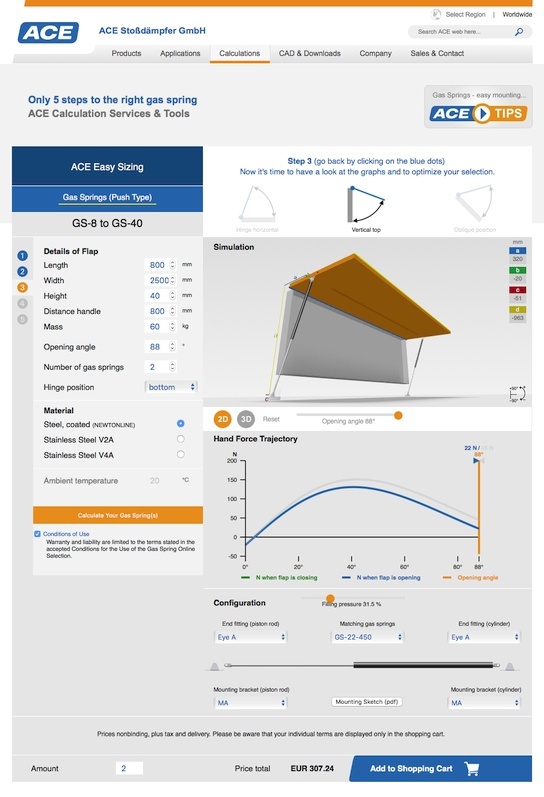 At www.ace-ace.com/com/calculations/motion-control/gas-spring-online-selection.html experienced users can thus reach the machine element tailored to their application in less than a minute. The exact matching ACE gas spring and the required mounting accessories are specified precisely. In addition, a montage sketch can be generated with the help of the online tool. In the interest of their customers, ACE Stoßdämpfer GmbH uses this service to shorten the entire process from design, through ordering, to delivery. While the order is triggered by an automatic request to both show delivery time and price in the current version of the software, the plan for the future is to let customers use the online calculation 24/7 and check-out directly via ACE's e-shop. After the order, now and in the future, each individual gas spring is filled with nitrogen in the Langenfeld warehouse of ACE and shipped by parcel service. For customers who prefer the previous service, both personal advice and assistance in calculating and ordering the right ACE gas springs for every application are of course still available by phone, e-mail and direct consultation with the ACE sales team in the customer's region. "The unrivaled user experience with comparable tools for our industrial and safety shock absorbers has been incorporated into the development of this unique, user-friendly solution that allows our customers to determine which ACE gas spring is ideally suited for almost any of their diverse applications," says André Weßling, responsible for both worldwide marketing and the online tools project group at ACE Stoßdämpfer GmbH. He emphasizes that the focus of the effort has been on making the operation of the new online calculation program for the ACE gas springs as comfortable and intuitive as possible. 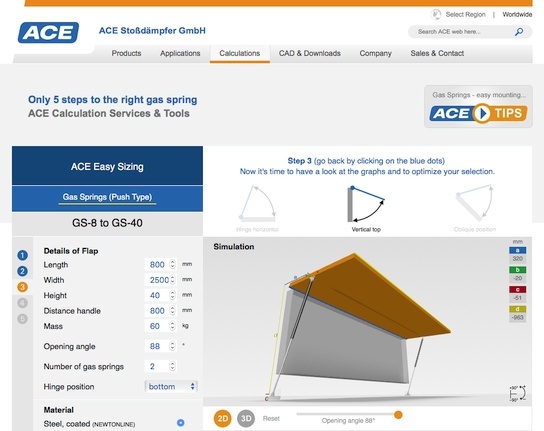 At www.ace-ace.com/com/calculations/motion-control/gas-spring-online-selection.html prospective customers can now put the program to the test to find out how well ACE Stoßdämpfer GmbH has accomplished this task.